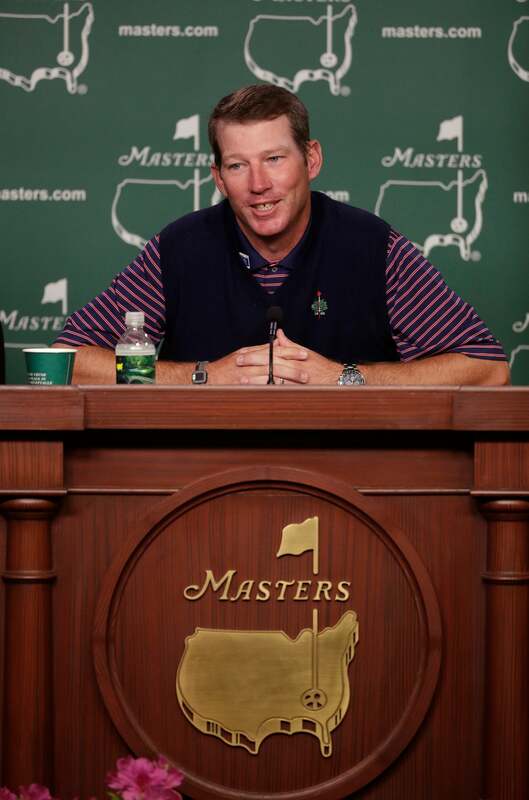 AUGUSTA, Ga. (AP) -- An invitation to the Masters might be only the second-best offer Jim Herman got this week. Less than 24 hours after winning the Shell Open, Donald J. Trump joked that Herman, a former assistant golf pro at one of his resorts, might be considered for a cabinet-level post in a new Trump administration. "That's a character - the kind of character - you want. Somebody who can handle the pressure," Trump told The Associated Press in a telephone interview Monday between campaign stops in Wisconsin. The GOP presidential front-runner was laughing, but dead-serious when he added, "I'm very happy and proud to have helped him out." The self-taught scrambler who wouldn't give up the game and the mogul with a love for golf first came together in 2006. Mickie Gallagher, a mutual friend and the head pro at Trump National in Bedminster, New Jersey, hired Herman as one of his assistants. Soon enough, Herman got a call that the boss was headed over to play and wanted him to join the foursome. "I don't know what it is; when I play with him, I usually play pretty well," Herman recalled Monday. "But yeah, he's been a big supporter of mine. He helped me early on in my years financially and maybe just a little shot in the arm of confidence." "I play with many people. Lots of them think they're going to be pros, but you and I know that's not usually the case," Trump said. "He'd shoot really low rounds when we played and ... I'd ask him after a round, 'Where are you going after this?' And he'd say 'I'm giving somebody a lesson,'" Trump added. "I'd say, 'You got to give it (professional golf) a shot. You got a real chance to be something special.'" Herman had tried pro golf for the first time in 2000, but he struggled on the Florida mini-tours and moved into the golf shop in 2004 in search of a steady paycheck. He gave lessons and sold clubs and clothes. But with Trump's stake, Herman finally advanced far enough through Q-School to earn a Web.com Tour spot in 2008. He played 114 events and finally won one. He moved up to the PGA Tour in 2011, but was 0-for-106 tournaments until Sunday. On the 72nd green at the Shell Open, Herman, 38, needed a two-putt from 20-feet for a win, a two-year tour exemption and the Masters invitation. His former boss was in Wisconsin when he learned Herman was in contention. He immediately ordered the channel changed to NBC. "I mean those guys aren't pushovers, so it was great see him going down the last fairway," Trump recalled. "That last drive, the last three shots, that wasn't an easy two-putt, it's up on a hill and something like 20 feet. "But he did great," he added. "I'm not surprised." Herman, despite being ranked 191st in the world at that moment, was surprisingly calm. It wasn't until he'd sealed the deal that he let his emotions show. But there was a hint how much he wanted the win at No. 16, where he chipped in from 40 feet for birdie, turning what had been a weakness - his short game - into a strength and pumping his fists. It turned the rest of his schedule topsy-turvy. "Yeah, I was planning on watching, I really enjoy watching the Masters," he joked. "I've been a fan of golf my whole life, dreaming of playing here and now it's happened. I was planning on flying home last night, and I was going to get home at midnight, see my kids this morning, take my daughter to school and that's obviously changed." With most of the rest of his family scrambling to get here ahead of Thursday's start, Herman has plenty of planning and practicing to do before teeing off Thursday. He's only played Augusta National once - his agent set up a round with a member in November, and he carded a 1-under 71. Herman's last confidence-boosting round with his old boss was a few days before Easter. Herman still wears Trump Golf crest on his shirt and bag. "Had another really good round with him," Herman said, adding that he and Trump be the other twosome. One thing that won't change, though, are the ball markers that Herman uses on the greens. Steven Wyder, a friend and high school teacher back in Florida, sends Herman a number of presidential dollar gold coins to use, depending on where he's playing. "I'm expecting we'll probably have President Eisenhower (a member of Augusta National) this week," Herman chuckled. Any chance he'll return next year with a Trump marker?